Everything about this exhibition has been stolen: the concept, the curatorial conceit, the press release, and a proportion of the chosen artists. 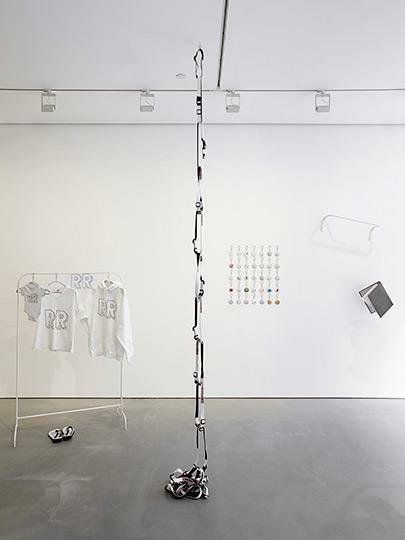 The original ‘Brand Innovations for Ubiquitous Authorship’ was curated by artist Artie Vierkant at Higher Pictures gallery in New York in July 2012. 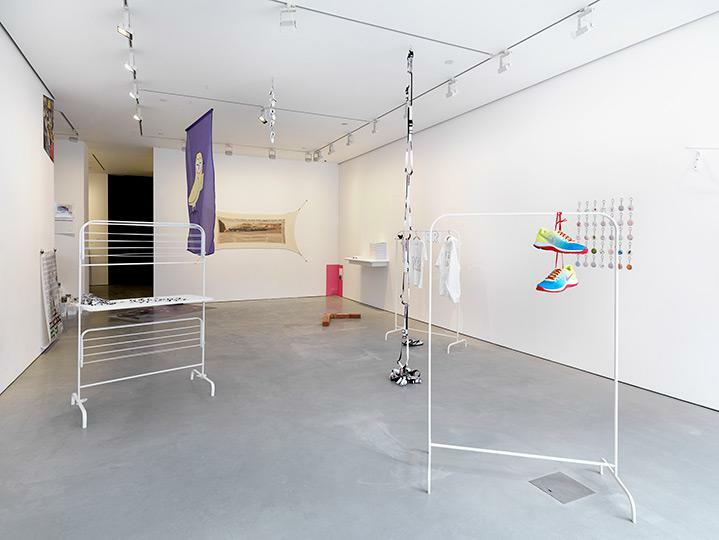 The 2013 reincarnation at Carroll/Fletcher gallery in London, curated by so-called hacktivist duo Eva and Franco Mattes, mirrors all aspects of the original concept and process, using a different location, and a slightly different accumulation of artworks. Each exhibiting artist was asked to produce an object using a custom printing or fabrication service. In both cases, the show was commissioned and the press release drafted before a single work had been seen. These now omnipresent custom printing services are ostensibly platforms for creativity and self-expression within the realm of commonplace goods. While the tools for image creation and dissemination have become increasingly democratised, such services are expanding this domain into the realm of objects. However, the inherently remote nature of ordering a customised mug, t-shirt or phone-case, with a digitally rendered image, inevitably usurps the notion of individual creativity and, instead, transforms a plethora of authors into a mass of commodities. Utilising digital customisation, objects are intractably opposed to Walter Benjamin’s infamous notion of aura. Although, it is nothing new that the loss of aura has become more pronounced in proportion to technological advancement, ‘Brand Innovations for Ubiquitous Authorship’ offers a playful and intelligent perspective on the consumer/creator relationship, and the progressive collapse of hierarchy between the two. The ‘self-expression’ that custom printing and fabrication services provide supposes, at its naivest level, that an exhibition comprised entirely of objects which utilise them would be one replete with character - albeit a distanced one. 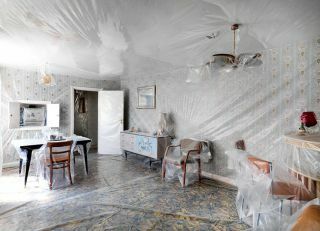 However, it is strikingly devoid of character; a room full of impenetrable objects. Objects such as flip-flops, key rings, seat-belts, toilet paper, vinyl images and clothing. It is their very object-hood - their inability to remove themselves from their own function - that creates a barrier between thing and image. Daniel Temkin’s ‘Dither Study #40 Flip Flops’ is a spattering of flip flops, covered in green and pink pixels. 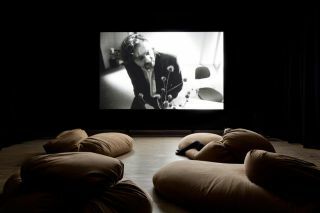 Temkin’s ‘Dither Series’ (begun in 2011) is a ‘collaboration with Photoshop’, in which he gives the programme an impossible task, ‘to draw a solid colour or gradient with a palette of incompatible colours, thus exposing the dithering algorithm’s complex, seemingly irrational patterns.’ These are then exhibited as large-scale prints, on screen, or, in this case, on a pile of flip-flops. 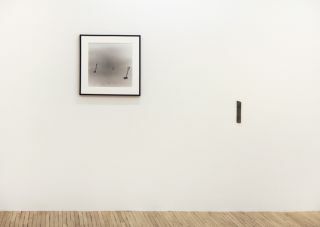 Here, Temkin’s decision to print his dithering pattern onto a flip-flop exposes an entirely arbitrary link between object and image - one which is purposefully apparent throughout the show. 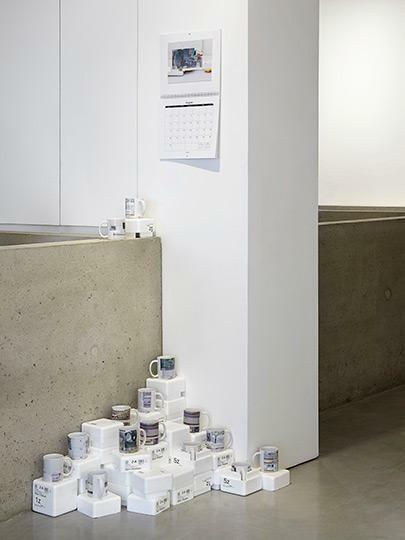 Sean Raspet’s offering - a stack of printed mugs, some snugly sat in their polystyrene packaging boxes, others piled precariously on top - similarly indicates a discretionary relationship between object and image imposed upon it. His designs layer photographs: elbows and legs caught in passing on the street, the arms of empty chairs and glimpses of shoes are superimposed on top of one another, producing a graphic that is at once voyeuristic and empty. This work is entitled ‘2Registration::(‘Untz’tled (Police Incident (5)))5, (((2007-2012) 2007-2011.’)2012)’, indicating the images reference a specific, potentially violent event. It is through the lack of any comprehensible reasoning for printing these images onto white mugs, that the mutable nature of digital imagery is acknowledged. As the number of images and the speed of their transmission increase, fewer images tend to dominate, resulting in the calcification of any ‘iconic’ image. It is progressively rare to witness a single, still image. Raspet’s superimpositions reference the increasing need for images to correlate; to create meaning collectively, rather than solitarily. The curation of this exhibition rests somewhere between haphazard and extensively considered. Initially it seems sparse, but there are images everywhere - vinyl works are plastered into the upper and lower gallery corners, large images are stuck on the floor and objects are suspended from the ceiling. 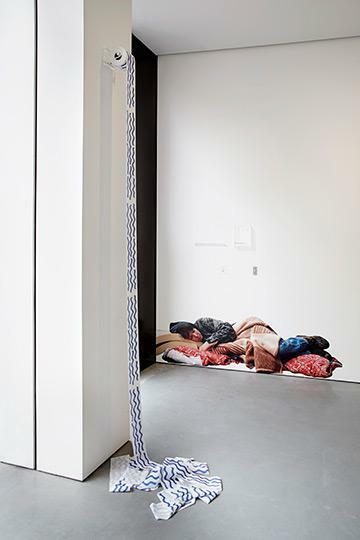 Justin Kemp’s large-scale photograph ‘Homeless Person Sleeping’ is on the wall as you immediately enter the gallery, forcing you to walk past it before fully acknowledging its presence; an uncomfortable parallel of these circumstances in reality. Similarly, the use of images in corners mimics the way in which we encounter graphics on our computer screens - in different windows, thumbnails, cursors or pop ups. Andrew Norman Wilson’s ‘The Rainbow Girl-9’, an inkjet print on an adhesive fabric poster, is lurid pink, and stretches over a plug socket on the wall. The image is taken from a series in which Wilson collects anomalies from Google books, such as software distortions, or the hands of Google employees as they are scanning. ‘The Rainbow Girl-9’ shows the hand of an employee wearing a pink ‘finger condom’ as ‘she’ holds something in place for scanning. 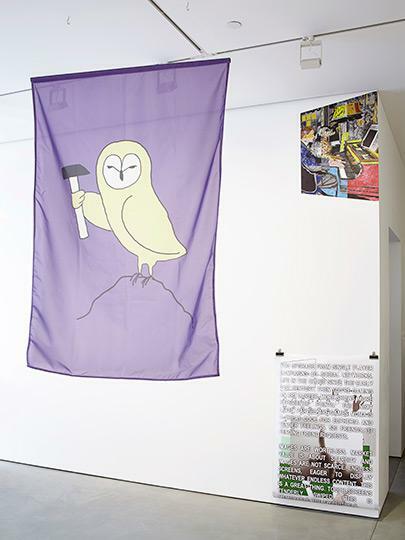 The series highlights the complex nature of digitising information; the labour involved does not necessarily require any cognitive interaction with its content. Meanwhile we, as consumers, are oblivious to the anonymous workers, whom Wilson references as ScanOps, as the information spontaneously manifests and joins the infinite digital archive. ‘Brand Innovations for Ubiquitous Authorship’ could never have been a unique exhibition; it was calling out to be stolen. The original show set out to challenge traditional ideas of object production and material constraint. Eva and Franco Mattes have augmented this idea, challenging not only object and image production, but also any form of authorship itself.